Given how opaque decision-making in China can be, it’s tempting to see all manner of conspiracies behind the government’s recent crackdown on companies that have expanded rapidly abroad. In fact, the reasoning behind the campaign is straightforward. The real problem is that it’s likely to damage China in the long run. According to Bloomberg, Chinese regulators’ increased scrutiny of formerly high-flying companies Dalian Wanda Group Co, Anbang Insurance Group Co, HNA Group Co and Fosun International Ltd may have been sparked by an internal government report warning of parallels between China’s situation and Japan’s just before its bust. One similarity: a slew of flashy and possibly foolish overseas acquisitions. China’s financial officials appear to have concluded that such “irrational” deals created vulnerabilities for the Japanese economy — weaknesses they’re keen to avoid. This explanation makes sense, given Chinese leaders’ fear of repeating others’ mistakes. Still, the fact that the dragnet has pulled in some of China’s most politically connected firms has left many China watchers searching for alternative motivations. There are four main theories. Some believe the crackdown is political. This is a critically important year for China and its leader Xi Jinping, with a Politburo reshuffle this fall set to cement his hold on power. In such a charged environment, Chinese leaders could be looking to settle scores by targeting companies linked to their political rivals. Others see more personal forces at work. Despite his speeches in defence of free trade and globalisation, Xi hasn’t been the most business-friendly Chinese leader. He comes from a family with a stellar revolutionary pedigree; it’s possible he just doesn’t like China’s tycoons, whom some Chinese officials believe have gotten rich off the backs of the Chinese state. Or currency could be the decisive factor. The pace of capital outflows reached alarming proportions in 2016, and only a tightening of capital controls around the turn of the year staved off downward pressure on the renminbi. Regulators might feel they need to continue such tightening to prevent depreciation pressure from re-emerging, so they’re monitoring every channel by which capital might leave China. Finally, some analysts wonder if a debt bomb may be lurking in one or more of these companies. Regulators could be undertaking a forced deleveraging while they assess the companies’ financial linkages to the Chinese banking system. These explanations aren’t mutually exclusive. Yet neither do they get to the fundamental purpose of the recent crackdown. Effectively, the Chinese state is trying to assert greater control over where and how the country’s assets are managed. That, apparently, is what the Japanese didn’t properly do. As far back as March, for instance, People’s Bank of China Governor Zhou Xiaochuan warned that overseas investments in sports, leisure and entertainment were no longer in favour as they had no “national benefit”. The buying of sports clubs particularly sticks in regulators’ craws. Not only are they seen as vanity projects, but the valuations for such assets are difficult to assess properly, let alone justify, which adds to the sense Chinese companies are simply spiriting assets overseas. Even as regulators tighten the screws in those areas, the government is actively encouraging both private and state-owned firms to undertake investments in line with its industrial and geopolitical policies. Funding for and acquisitions of businesses that undertake research on artificial intelligence are welcome, as is anything that can be conceivably linked to Xi’s ballyhooed Belt and Road infrastructure push. That’s why China’s $1.1 billion (Dh4.04 billion) lease on the Sri Lankan port of Hambantota could be inked in recent days even as the government reportedly pressured Anbang to sell its overseas assets, which include New York’s Waldorf Astoria hotel. Given how much the state’s influence over the domestic economy has expanded under Xi, the assertion of control over foreign investment is hardly surprising. The fact that these companies are nominally private entities has no bearing on the leadership’s desire to manage their spending. In fact, it may well make officials more eager to stymie deals. Once private entities have successfully moved assets abroad, it’s hard for Chinese regulators to force them to bring money back. Underpinning all of these efforts is a genuine desire among officials to better enforce existing laws. The challenge, of course, is that suddenly enforcing the rules has the same effect as overt capital controls. Instead of inspiring confidence among the foreign business and investment communities, these policies have done the opposite. More importantly, while the government’s efforts to calibrate outbound investment flows may alleviate short-term financial risks, they will only exacerbate China’s fundamental problem: the misallocation of capital. Politically motivated investment decisions are what have brought China to the point of fearing a Japan-style bust in the first place. 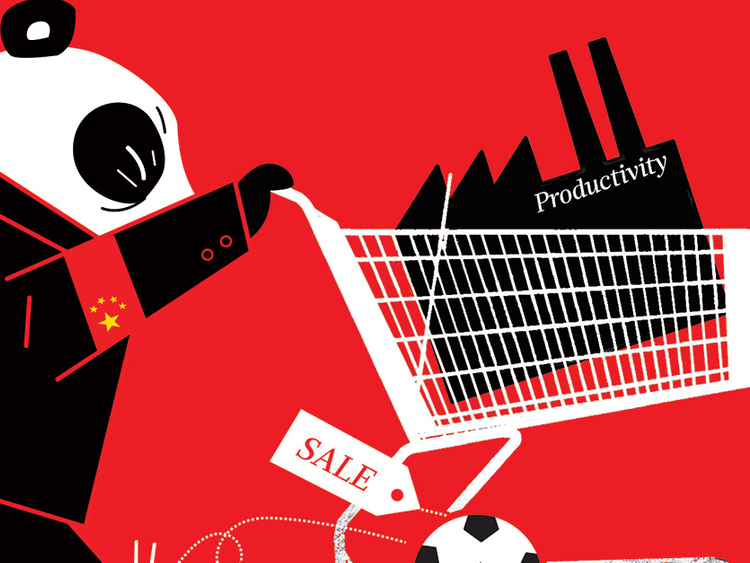 China’s main economic challenge is weak productivity growth, an issue that can only be solved by deploying the country’s resources more efficiently. The government may well be right that purchases of European soccer teams don’t count as productivity-boosting investments. But that doesn’t mean rail lines to Kazakhstan do.